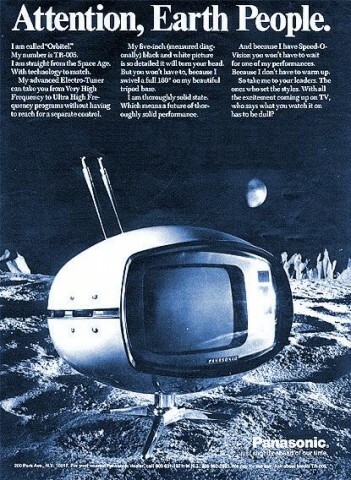 With space exploration filling the air and capturing the fascination of the entire world, with TV making huge strides in improving TV technology, 1970s become one of the most aesthetically daring decades in TV manufacturing. The Panasonic TR-005 Orbitel, more popularly known as the “Flying Saucer” TV, looks exactly what it is named after. It has also been called “The Eyeball” due to it concave, sort of fish-eye shape. This model was in production for ten years from the 1960’s to the early 70s. A TR-005C was also sold and had a different power transformer form the TR-005. The TR-005 had a 5-inch screen (as small as today’s phablet can you imagine? ), an earphone jack and could rotate 180 degrees on its tripod. Zenith revealed its first colored TV set in 1968. Four years later, it has taken huge strides in developing vividly colored TVsets. The 1972 Zenith was a major step-up in brightness, contrast, picture detail and richness of color. This TV set was available in an impressive 4 sizes: 16 inch, 19 inch, 23 inch and 25 inch diagonal. A joint effort of radio and TV set manufacturing pioneer Philco and the Ford Motor Company the B450ETG was the last vacuum set tubes. Shortly after, the American TV set industry shifted to transistorized TV chassis. The Sony Trinitron was a real marvel when it was first introduced in the 1950s. It was received with wide acclaim because of its images that were 25% brighter than the shadow mask televisions available in that same era. In the market for over half a century, from the 1950s to 2006, the Trinitron is a testament to the kind of quality Sony has since become famous for. The last Trinitron ceased production in 2008.
component of the consoles instead of the removable media we are more used to today. The games, usually occupying the whole screen, were very primitive. 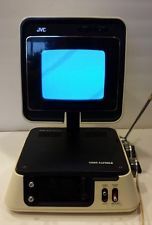 In stark contrast to the high definition and almost life-like video games of today, the games on the Magnavox Console TV sets were made up mostly of dots, lines and blocks. This is one of the most memorable designs of the 1970s. Still riding on the momentum of the moon landing almost 9 years prior, this “space-abilia” became quite a huge hit. The JVC Model 3100D was only 7 inches long diagonally and was a fold-down model much like the Flying Saucer TV. It was incredibly neat because it folded into what looked like a pyramid-like space capsule, earning it the nickname “The Pyramid”.